Also covered are Olympic-based Movies and TV shows, Special Olympics and even ‘Fantasy’ Olympics. "Aristotle compiled the first known comprehensive list of all winners of the Olympic Games. Which means that quite probably he was sat in a bar with Plato, muttering 'Go on then, give me any year you like and I'll tell you who won the four-man bobsleigh.' "
"The obvious precedent for Beijing 2008 was the Berlin Olympics, in 1936. Both were showcases for a muscle-flexing nation, although Hitler made an elementary error when he chose not to dress his young National Socialists in lime-green catsuits laced with twinkling fairy lights." "Performance enhancing drugs are banned in the Olympics. OK, we can swing with that. But performance ‘debilitating’ drugs should not be banned. Smoke a joint and win the 100 metres, fair play for you. That's pretty good. Unless someone's dangling a Mars bar off in the distance." "The Olympics is my favourite sporting event. Although I have a problem with that silver medal. When you think about it, you win the gold - you feel good, you win the bronze - you think, 'Well at least I got something'. But when you win silver, it's like, 'Congratulations, you ‘almost’ won. Of all the losers, you came in first of that group. You're the number one ‘loser.’ No one lost ahead of you." "Had my dream again where I'm making love, and the Olympic judges are watching. I'd nailed the compulsories, so this is it, the finals. I got a 9.8 from the Canadians, a perfect 10 from the Americans, and my mother, disguised as an East German judge, gave me a 5.6. Must have been the dismount." On how the post-Iraq War USA is perceived by the Olympics world - "We're the bullies on the block, the muscle-bound beach bum who kicks sand in the faces of 97-pound weaklings, the big-box chain store that knocks out the mom-and-pop hardware business, Godzilla munching and crunching our way through Tokyo, Clubber Lang pummelling Rocky, Lord Voldemort plotting to kill Harry Potter ... Even Canadians don't cheer America's victories anymore." "The 1992 US Olympic basketball team is the best sports team ever, the equivalent of rounding up the greatest American writers of the last century or so and watching them collaborate: 'OK, Twain, you do the dialogue and hand off to Faulkner. He'll do the interior monologue. Hemingway will edit - no, don't make that face, you know you overwrite. And be nice to Cheever. He's young, but he's got a good ear. Wharton and Cather can't play - they're girls.' "
Given that Team GB leads the world in the Irony Olympics, with sending ourselves up a national sport, why have we been so slow off the mark when it comes to venting our predilection for satire on the London Olympics? It’s as if a ruling had come down from on high that said: "Hey chaps, we’re all jolly well pulling together and we don’t need anybody upsetting the apple cart." DIRECT FROM THE UK PUBLISHER - BLUE EYED BOOKS. 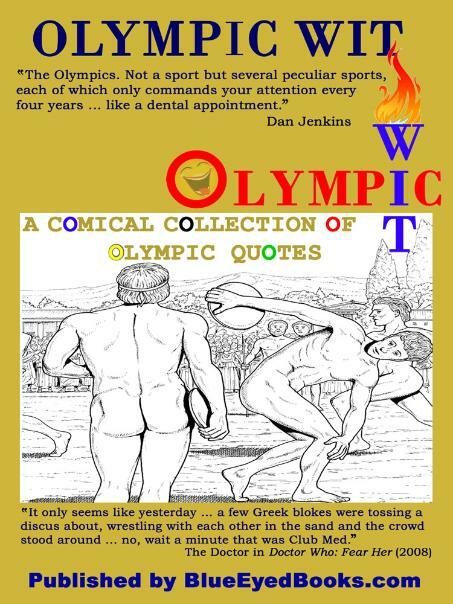 Olympic Wit is a Comical Collection of Humorous Quotations about the Olympic Games - Modern and Ancient, Summer and Winter, the athletes, the host cities and stadium, opening and closing ceremonies, the Olympic sports, the Olympic Oath, the Olympic flame, the Olympic mascots, the IOC, the nations, the medals, the heroes and the cheats, the triumphs and the controversies. The Olympics. Not a sport but several peculiar sports, each of which only commands your attention every four years, like a dental appointment. On poker not making the Athens Olympics - "After all, the ribbon-waving rhythmic gymnasts are in. The shuttlecock-chasing badminton players are in. Even the ice-sweeping curlers are in. And poker's out? That's like throwing a party for mankind's greatest inventions and forgetting to invite indoor plumbing." Niles Crane after Frasier hired Daphne - "Why did you have to hire Venus herself? Couldn't you have found some beefy, East-European scrub woman who reeked of ammonia?" Frasier Crane: "Well, I asked, but it was an Olympic year. The agency was fresh out." The Olympics would obviously be better if every athlete carried a sword. If competitors had sharpened blades, equestrian would at least be watchable and gymnastics would require a lot more strategy. "Is it too much to ask that they limit the Olympics to actual mainstream sports? Admitting badminton to the Games is like admitting whiffle ball or red rover. It's something you do on a picnic between helpings of potato salad." The Doctor [David Tennant]: It only seems like yesterday … a few Greek blokes were tossing a discus about, wrestling with each other in the sand and the crowd stood around ... no, wait a minute that was Club Med. I don't care about the Olympics. It's like watching gym. Off the top of my head, I can only think of one thing more insipid than the Olympics ... and that's the Winter Olympics. The 2012 Olympics is going to cost £8 billion which is a lot of money. It'll probably bankrupt London. But you can't put a price on two bronze medals in cycling. please email us at Blue Eyed Books. Q: Why did they send the Olympic judge out in search of the lost wedding ring? A: Because he was a medal detector. Q: Where does the track and field team keep its Olympic medals? A: In the pole vault. Q: Why isn't sun-tanning an Olympic sport? A: Because the best you can ever get is bronze.